It’s Adventure Friday! 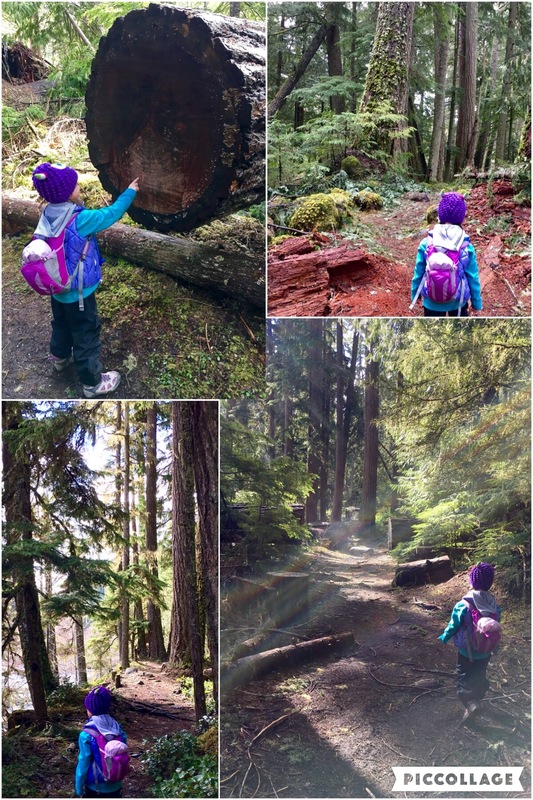 Little Hiking Buddy and I decided to head south to Skookum Flats this morning. 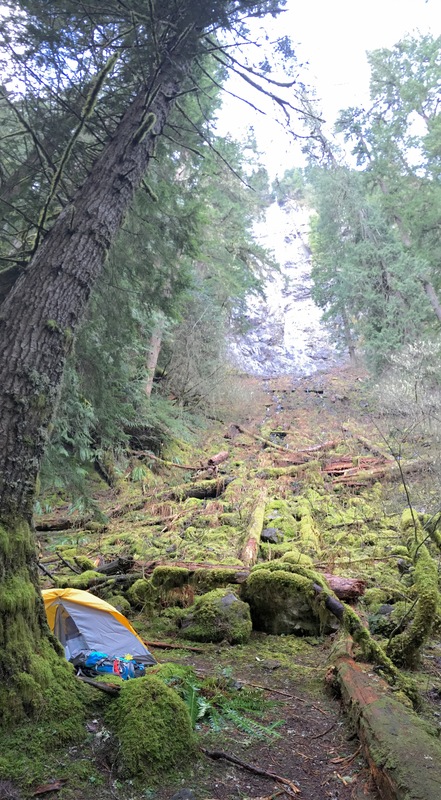 To increase the physical challenge of this relatively flat trail along the White River, I included additional weight to my load in the form of a single-person tent and a camping stove. Now that spring has arrived, backpacking season is just around the corner, and I need to start thinking about what I can feasibly bring along with me on overnight treks into the wilderness this summer. Besides, LHB’s love of “camping” provided added incentive for her to keep a good pace so we would have time to pitch the tent during our lunch break to enjoy some extra special treats in comfort. 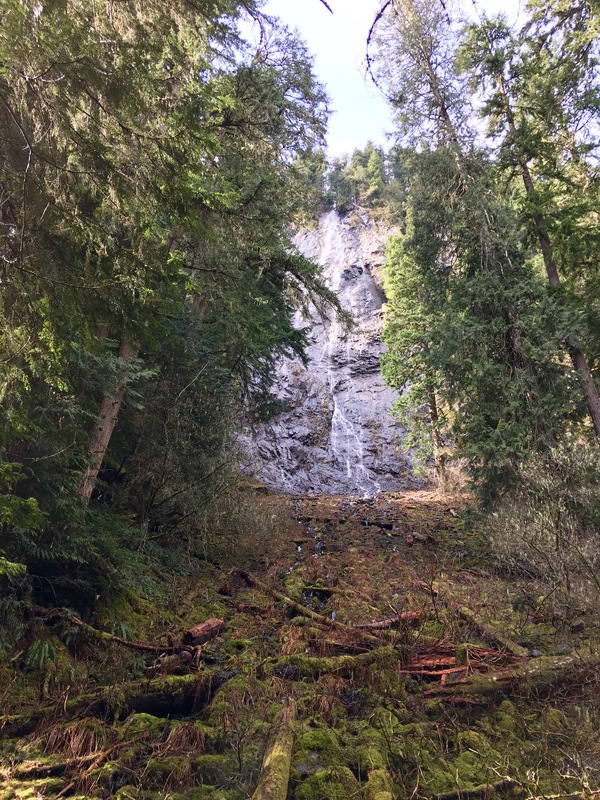 Located in Enumclaw, just 4 miles north of Snoquera Falls, the North Trailhead to Skookum Falls is the shorter of the two entry points to this lovely trail. LHB and I noticed just one other car parked in front of the restrooms upon our arrival at 10 am. We quickly dressed ourselves for what was expected to be a muddy trek along the river and headed across the street into the forest. The trail immediately led us into a different world from which we had come, transforming us from mere bystanders into willing explorers ready to seek refuge in this aqueous wilderness. As we walked along the moss-laden path through the forest, we could hear the wild roar of the river rushing beside us. Every so often, we were offered lustrous glimpses of water sparkling under the morning sun with snow-capped peaks rising in the near distance. We hadn’t traveled more than a quarter mile before LHB thought she found the perfect spot to set up camp for the afternoon. 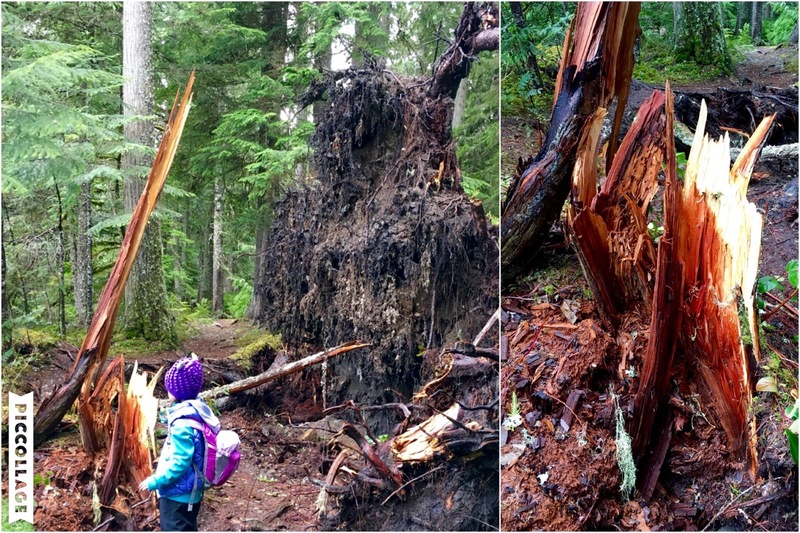 Unfortunately for her, we had at least another 2 miles before reaching our picnic spot. When I reminded her of the yummy goodness stowed in my pack, which could only be enjoyed once we reached the Falls, she quickly returned to her usual pace and ran ahead of me. No matter how big or small, incentives matter to us all. While hers revolved around sweets and treats, mine involved the ability to manage a sizable load for as comfortably as possible given our intended distance. This hike was a deceivingly beautiful walk through nature, one which allowed me to forget the 25 lbs. perched on my back. 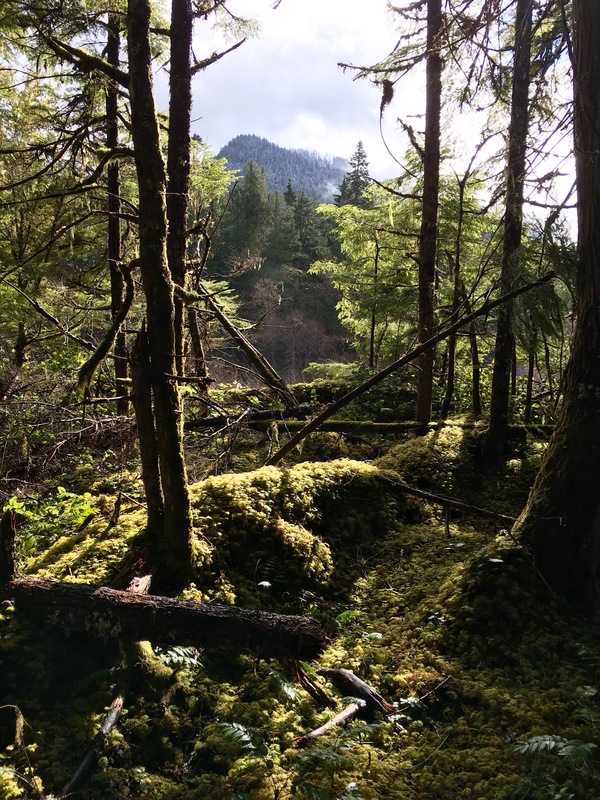 We climbed over fallen trunks from recent storms, jumped across muddied puddles filled by the cresting waves of the once swollen river, and followed tracks of ever present, yet seemingly invisible elk throughout our trek in this lush forest. 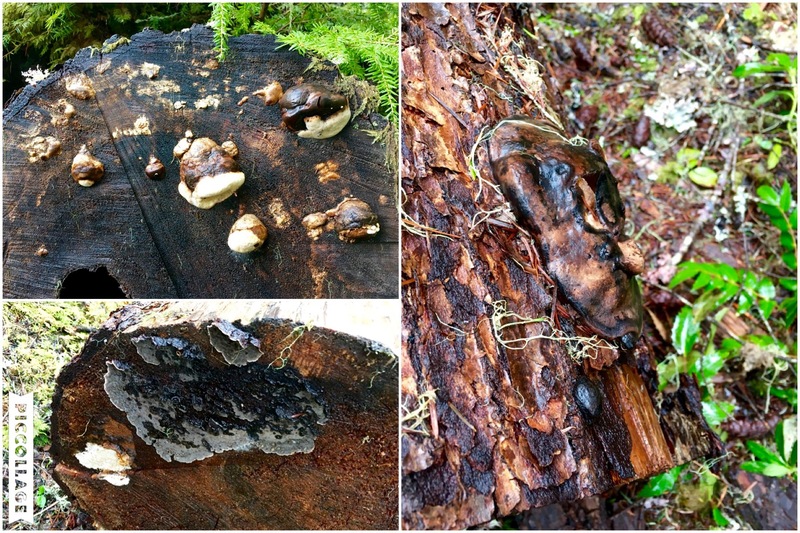 LHB very much enjoyed examining the various fungi and lichen growing along the trail, as well as counting the number of rings in each of the cut trunks that allowed us to continue on our way. Before we knew it, we had already covered almost 2 miles of distance. After a brief hike up a slightly narrow and rocky bit of trail, we found ourselves overlooking a whirlpool created by the inlet of rushing water circling past the tangled roots of a felled tree now deeply entrenched in the river bed. LHB wanted to understand more about the movement of water, which led to her increasing desire to find the waterfalls. Once we descended from the craggy trail, we heard a different rhythm of flowing water in the distance. It was no longer the voice of the river, but that of the falls above us. LHB ran ahead to seek a better view. It didn’t matter to her this was merely a minor runoff rather than the full Skookum Falls. She was in love with music of the cascading orchestra and immediately requested we set up camp there. And so we did. 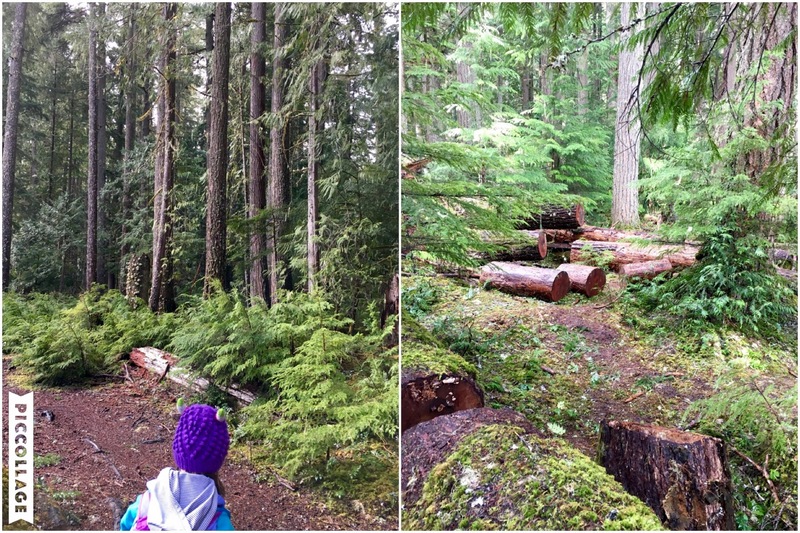 Though I had previously set up my TNF® Stormbreak 1 in our front yard, this was my first attempt to do so on the trail (and after having lugged it in my pack for any distance). Surprisingly enough, LHB was comfortably settled into a fully staked tent within minutes of it being unpacked. While she examined her environs safely from the confines of the tent and away from flying pests, I pulled out my JetBoil to make us some hot chocolate. 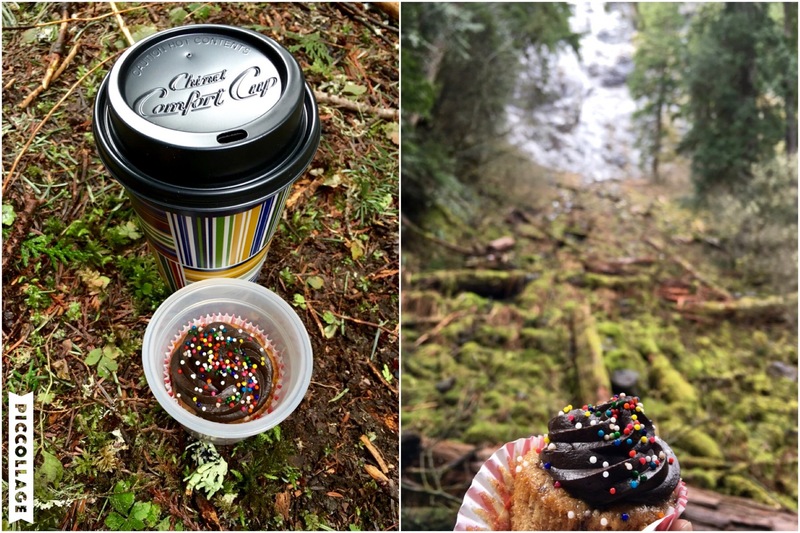 Nestled into our little abode at the foot of the falls, we enjoyed our savory lunch of croissants, cheese and grapes. LHB couldn’t wait for dessert! Not only did we have hot chocolate, but I had carefully packed two chocolate frosted banana cupcakes she and I had baked the prior day. She was excited to taste her rainbow sprinkled chocolatey goodness. I’m happy to say she was not disappointed. The lone group ahead returned our way and informed us of our short distance from the Falls. We decided to decamp in an effort to take in a quick view of the major cascades before making our way back to the car. 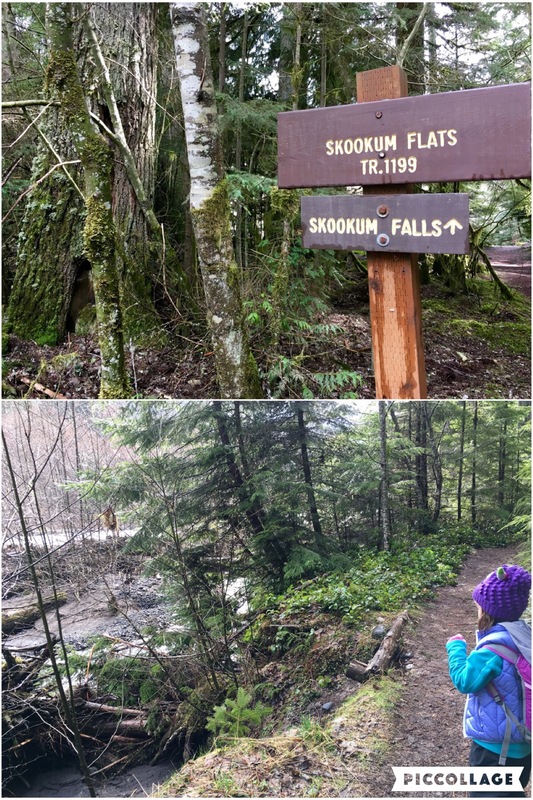 Alas, we had only enough time to view Skookum Falls from its very base. Unfortunately, the uneven footing of the boot path up was far too treacherous an attempt for us both given the little time we had left, as well as the added bulk I had attached to me. LHB was also not thrilled at the idea of having to climb over elk droppings; so rather than convince her otherwise, I jokingly raced her back to the trailhead to see who would get that last helping of gummy bears stashed in the car. We made it back in record time, and she was kind enough to share her winnings with me.